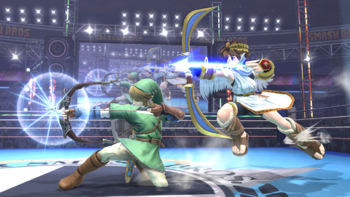 Link preparing to fire an arrow alongside Pit in Super Smash Bros. for Wii U. This article is about Link's and Toon Link's neutral special move. For Young Link's neutral special, see Fire Bow. The Hero's Bow (勇者の弓, Hero's Bow), known as the Bow (弓矢, Bow and Arrow) in Melee, is Link's and Toon Link's neutral special move in Super Smash Bros. Melee, Super Smash Bros. Brawl, and Super Smash Bros. 4, and is only Toon Link’s in Super Smash Bros. Ultimate. There are differences between Link and Toon Link's Hero Bows, though they both involve firing an arrow which is useful for stopping foes or camping, and holding the special button will greatly increase the range of the arrow fired. As the name suggests, the move involves each Link incarnation staying in place and charging up an arrow. Once charged, the player can only hold the arrow in place or fire it; this may force stalemates if the opponent has a lasting reflector, such as Fox. The arrow gains power, range and speed as it charges. A fully-charged arrow has great range and is thus useful for stopping approaches. However, all charge levels have passable knockback, though a fully-charged arrow is strong enough to KO a character in Sudden Death. In Brawl, this move is notable for being used in the Quickdraw technique, allowing Link to fire an arrow with no startup lag. Like most neutral special attacks, Link can turn around in midair if the backwards direction is pressed right after the bow is taken out. However, if combined with the aforementioned Quickdraw technique, a glitch may occur in which Link points his bow in one direction, but the arrow is fired in the other direction. This can be avoided if the bow is initiated in the air just before Link touches the ground, instead of the same instant Link touches the ground. Toon Link's arrows are slightly weaker and slower, but shoot at a very slight upwards angle and are noticeably "floatier" than Link's. This causes them to travel further when uncharged and hang in the air for longer. The Hero's Bow in Brawl and SSB4 fire arrows that are faster than its Melee counterpart, even when uncharged. Instead of the Hero's Bow, Young Link uses the Fire Bow instead. "Fires an arrow. The longer you hold the button, the stronger the shot." "Shorter-range arrows, but if you draw the bow fully, they'll deal a hefty blow." "Rapid-fire arrows that can pass through enemies to hit others." Power Bow: Greatly increases charge time and makes uncharged arrows do extremely low damage and drop right near Link's feet; a charged arrow however travels in a straight line, glows, and deals massive damage and knockback, to the point where it can KO at medium high percentages, giving Link a ranged KO option. Quickfire Bow: Arrows charge almost immediately, deal magic damage and can go straight through multiple targets, though they forsake damage and range, traveling a short distance before disappearing while doing set knockback. 2% uncharged, 8% fully charged. "Fire an arrow with your bow. Charge it up for more power and range." "Sets fire to the ground where the arrow lands, but the range is reduced." "Fires a piercing bow at high speed. Does less damage than normal arrows." Fire Bow (known as Fire Arrow in the PAL version): Charges almost immediately. Shoots flaming arrows that deal extremely low damage on hit and travel only three character lengths when fully charged, but will stay in the ground and continue to burn for about two seconds, allowing Toon Link to use the flames as a pseudo-PK Fire. 2% damage minimum charged, 7% maximum, 6% damage when an enemy touches it on the ground. Piercing Bow: Arrows fly straight and go through enemies and projectiles, at cost of distance and damage. 6% damage fully charged, 1% uncharged. Toon Link using his version of the Fire Bow. Toon Link using the Piercing Arrow. Link about to obtain the bow in the original The Legend of Zelda game. The bow is one of Link's main weapons in The Legend of Zelda series. In The Legend of Zelda: Ocarina of Time, Link could use Fire Arrows, as well as Ice and Light Arrows. In Melee, Link's bow is based on the Fairy Bow from The Legend of Zelda: Ocarina of Time. In Brawl and SSB4, Link's Hero's Bow is derived from The Legend of Zelda: Twilight Princess while Toon Link's is from The Legend of Zelda: The Wind Waker. The Quickfire Bow is a reference to the Light Arrows, as well as the bow having a quicker firing rate in the Zelda series than in Smash Bros. Artwork of Link aiming the Fairy Bow from The Legend of Zelda: Ocarina of Time. Animation of Link's Bow in Melee. Link's Hero's Bow in Brawl. Toon Link's version of the Hero's Bow. Toon Link using Hero's Bow in Super Smash Bros. for Nintendo 3DS. Toon Link using Hero's Bow in Super Smash Bros. for Wii U. Hero's Bow as shown by a Skill Preview in Ultimate. This page was last edited on March 10, 2019, at 19:01.